The Gare de Lyon train station was only built in 1900, yet it is now one of the main train stations in Paris that handles an average of 90 million travellers each year, which makes it the third busiest station in France and also one of the busiest stations within Europe. The Gare de Lyon is one of the main line train stations in Paris and was named after the city of Lyon, which is a popular stop for many long distance trains, and it was originally constructed for the 1900 World Fair, which is when numerous other monuments in Paris were also built, just like the Petit Palais. 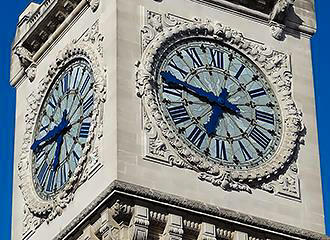 The building itself was designed in a classic example of style utilised for the period, although there is one element that makes this train station easy to recognise, which is the clock tower that is surprisingly similar to the Big Ben clock located at the Houses of Parliament in London, UK. 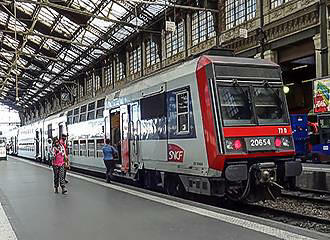 However, over the past years the train station has been modernised and updated in order to accommodate the larger TGV high speed trains that takes passengers to numerous destinations all over the country, but especially people travelling down to the Cote d’Azur region and the South of France. 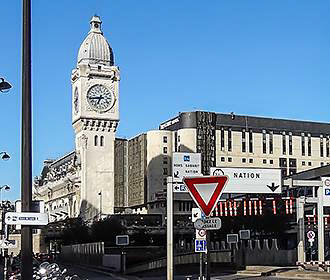 Located within the 12th Arrondissement of Paris, as well as the high speed TGV trains, the Gare de Lyon also serves as a station for the regional trains, the RER and also the Metro, but thinking about the trains, you will see on overhead departure boards that every train leaving the station will be listed and the platforms can be accessed by stairs or escalators from the other areas of the station. Inside the Gare de Lyon train station in Paris you will find there is a level that contains many different shops called the Galerie Diderot and it is here that you will be able to access the toilets, however, we would like to point out that there is an entrance fee for the toilets which is approximately €0.50. There is also the fabulous Train Bleu gourmet restaurant, which has been classed as an historical monument in Paris due to its incredible and plush Belle Epoque interior dating from 1900. However, if you cannot afford to have a meal here on the first floor overlooking the train lines, then there is the l’Express Bleu takeaway located directly underneath Le Train Bleu restaurant. There are main ticket sales desks within the station, which is where you can collect tickets that you have already purchased or buy one there and then, like for the TGV trains. Plus you will be pleased to know that the staff speak a number of different languages that are indicated on the ticket window for that person, but there are also automated ticket machines for Metro tickets, the standard Ile de France regional trains etc as well. Each of the train stations has a baggage storage room, which is quite handy if you wish to see some more of the tourist attractions in Paris prior to your travel and you do not wish to drag your cases around after booking out of a hotel. There are different sizes of lockers available and once you have gone through security, just like you need to in any airport, you select your locker and use Euro coins to access it and they vary in cost from around €6 up to about €12 and you can store your luggage for a maximum of 48 hours.